Hey all! I have more in the way of novel-writing news. For starters, The Cronian Incident is now just a few chapters short of completion. After over a year of writing, editing, and back and forth with my prospective-publisher, the novel is just about finished. All told, it is now 31 chapters long and just over 85,000 words in length. I anticipate it will be about 100,000 by the time its finished, though I have been known to exceed estimates in the past! And as per my agreement with my publisher, I have begun working on its sequel. Apparently, publishers like to know the people they sign have more books in them. And they prefer to release sequels within a few months of the first book, to ensure that any buzz they generate with the first release can be capitalized on. Lucky for me I had plans for a second and third novel before my publisher and I started talking, not to mention some spin offs. The Solar System is in the midst of a crisis. In the Jovian and Cronian systems, the populations are up in arms, thanks to an inflammatory document that has appeared on the local nets. Known as “The Jovian Manifesto”, this document details how a powerful faction in the Inner Solar System conspired to seize control over the moons of Callisto and Titan and forcibly alter them. Behind the leak is a mysterious personality known only as Clio, who is threatening to release all the details unless the guilty parties come forward. Back on Venus, a former analyst named Valéria Gallego is called before the Solar Assembly to investigate the Manifesto and its author. In this, she is assisted by Kadera, an infiltration specialist who can get in and out of any location in the Solar System. If they can determine its authenticity, perhaps they can prevent open conflict. But if not, the Inner Worlds may have no choice but to send armed forces to the Outer Worlds to ensure peace and stability. Between the European Space Agency (ESA), NASA, the Russians (Roscosmos), India (the ISRO), and China (CNSA), the lunar surface now has multiple permanent settlements. Whereas the ESA and NASA have established themselves at the southern polar region – in a domed settlement in the Shackleton Crater – and the Chinese have established a colony in the northern polar region, the Russians and Indians have claimed the mid-latitudes, where stable lava tubes have allowed for the creation of underground cities. And on the “Dark Side” of the Moon – that is to say, the side looking away from Earth – are a series of installations known as the Unrestricted Zones. It is here that all kinds of weird research, development and experiments take place. 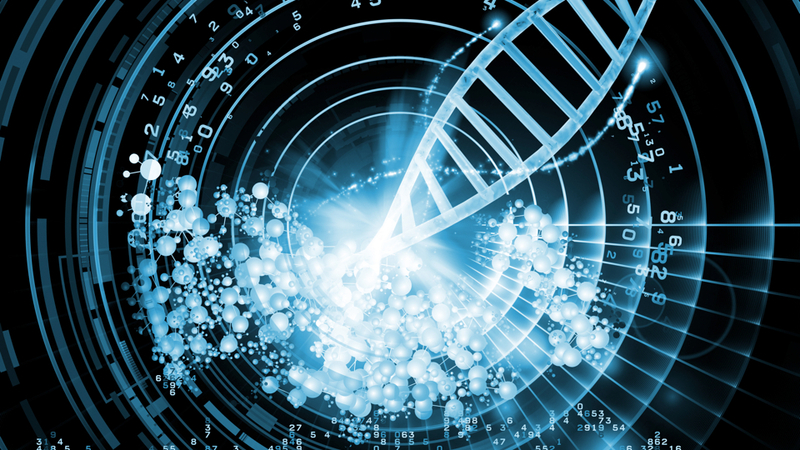 Nanotechnology, biotechnology, quantum computing, and man-machine interface – anything goes in these places! Ever since the explosion in learning that took place during the previous century, places all over Earth and the Moon have become dedicated to pursuing technological progress and integration without restriction. And it is here that a young man named Frankling Houte is seeking to go. Years ago, his sister – named Constant Houte – chose to undergo a procedure where her organic brain would be augmented by merging it with quantum components. But after all contact ceased, he is determined to find her and return her home. But whereas Franklin fancies himself a brave rescuer, it is his sister who will come to save him. This story will take place entirely in a generation ship that is making its way towards the nearby star system. Within the confines of this self-contained world, thousands of humans have committed to waiting and working for generations as their massive ship – the Traverse Velocity, which in astronomical terms refers to the speed at which a star moves perpendicular to our line of sight – transports them to an Earth-like world outside of our Solar System. The location of that world is up for grabs at the moment, mainly because new discoveries are being made all the time. Did you hear about the latest exoplanet discovery, located about 39 light years away and already said to be the “best place to look for signs of life beyond the Solar System”? Between that and new findings that claims how previous discoveries are not likely to be habitable after all, I’ve decided to leave the destination blank until I actually start writing it! But of course, no story would be complete without some intrigue and big ol’ inciting event! And the way I see it, things begin to go awry when the Captain and crew get notification that one of the passengers has awakened from cryosleep prematurely and disappeared into the ship. Shortly thereafter, one of the crew is found dead in what appears to be a sabotage attempt gone wrong. A ship-wide search begins to find the culprit while the atmosphere quickly devolves into one of paranoia and suspicion. To make matter worse, the crew becomes aware of another ship that is threatening to catch up and overtake them. It seems that another faction from the Solar System, which was also intent on settling (insert exoplanet here) is now trying to get their ahead of them. 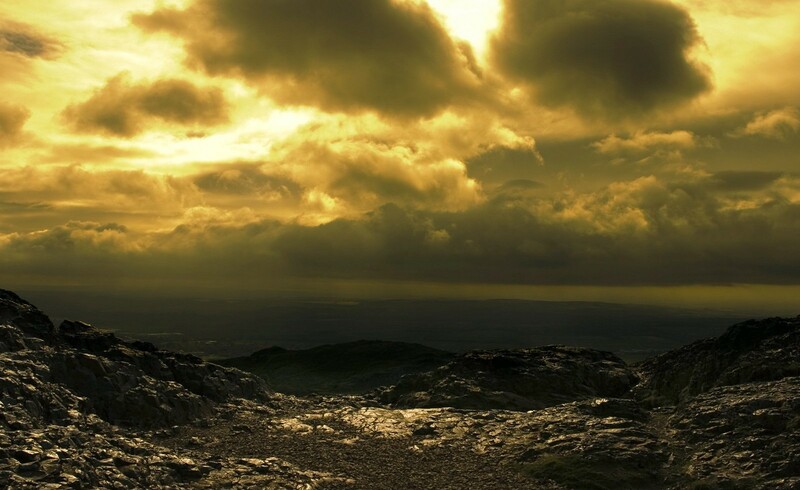 What began as a journey to a new world, characterized by hopes and dreams, has become a race to lay claim to a planet. And it appears that the planet may have inhabitants of its own, ones which are not interested in welcoming the intruders. A friend and mentor once told me that you shouldn’t be too worried about people stealing your ideas. To paraphrase what he said, you’ll have thousands of ideas, and no one can steal your work unless you’re careless. Those words rung true to me, mainly because I have far too many ideas, and not nearly enough of them are developed. Case in point, I’ve got four projects in the works, and none of them are near to completion. And yet, I find myself once again adding an idea to the mix. It came to me over the course of the last few months while working for Universe Today and trying to refine my ideas on science fiction. 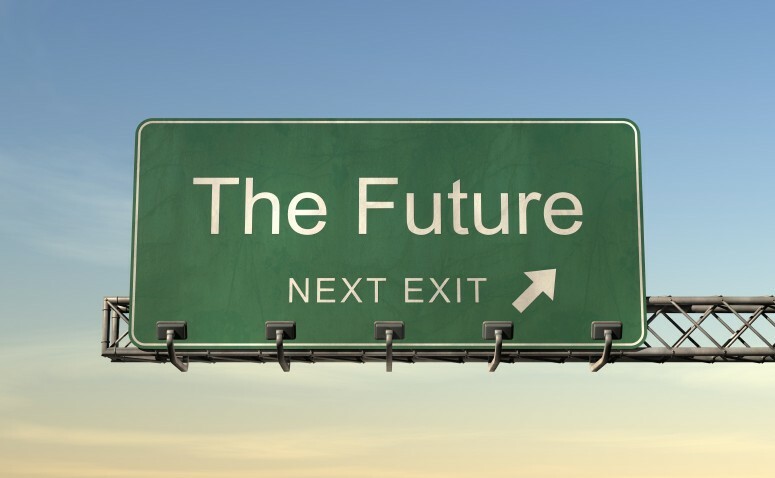 Basically, I have been thinking for some time that any piece written by me should focus on the paradoxical issues of Climate Change and technological change, and how these will play out to shape our near, not-too-distant, and distant future. 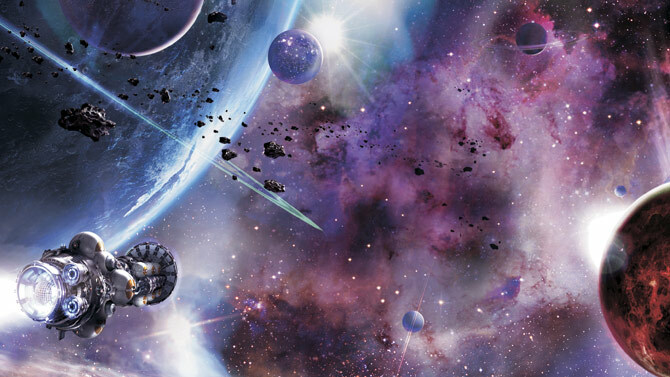 It is the late 22nd century, and humanity has grown to colonize almost every corner of the Solar System. Earth is now recovering from the worst aspects of “The Anthropocene”. Temperatures are dropping, species extinctions have stopped and are being reversed, and the population is stable, with over 13 billion people living in its cities, arcologies, and orbital habs. 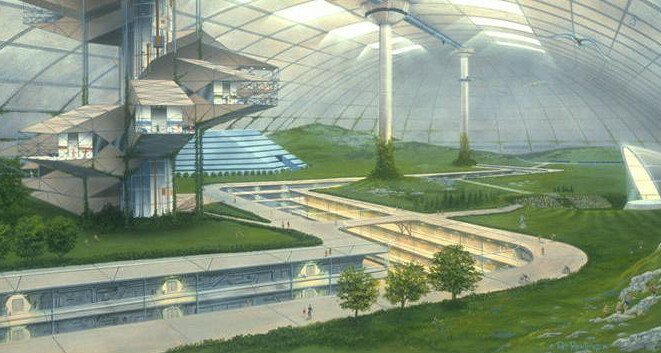 Over 1 million people live on the Moon, in cities built in lava tubes beneath the surface. Mars and Venus are also home to humanity. On Mars, the Martian people live in domes that crisscross the surface, a Space Elevator brings people to and from the planet, and a constant flow of shipping to and from the Asteroid Belt and Solar System keeps the place busy. On Venus, the Cythereans live in cities that float atop the planet’s extremely dense atmosphere, harnessing carbon from the clouds to create graphene and diamond-based materials. On all these worlds, humanity exists as a series of factions that know no national boundaries, and are collectively referred to as “Extros” – short for Extoprian. 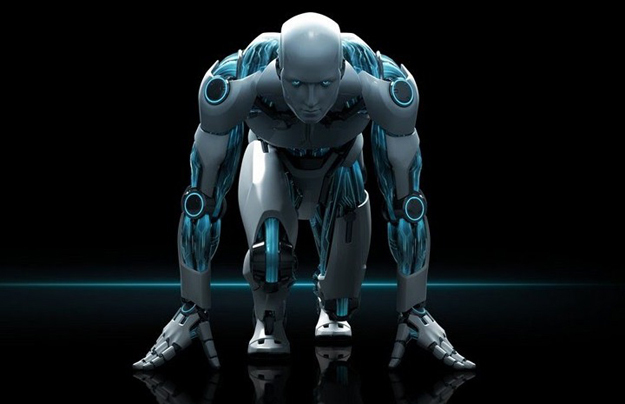 Thanks to over a century of runaway technological progress, diseases and disabilities have been eliminated, implants and embedded machinery allow for constant connectivity to the Nexus (future version of the Internet), and all vestiges of life are assisted by sentient programs and algorithms of various complexity. Meanwhile, the Outer Solar System hosts an entirely different mix of people. On the moons of Jupiter (the Jovians), Saturn (the Cronians), and Uranus (the Uranians), people enjoy a simpler existence. 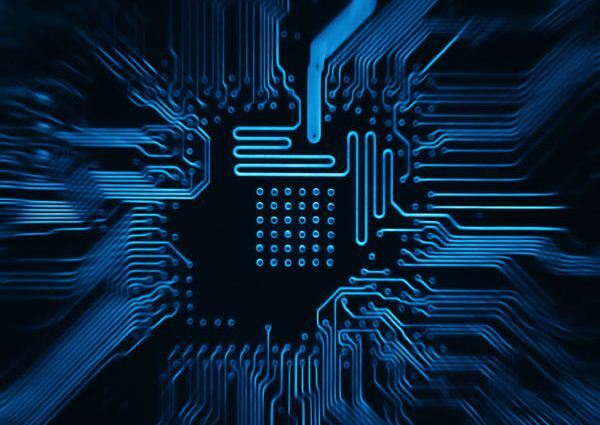 While they have access to plenty of advanced technology, many types of nanotech, biotech, and embeddadles are eschewed in favor of organic living, portable machines, and non-sentient computing. Despite the fact that the Jovians, Cronians and Uranians are made up of countless peoples and factions, collectively, they are often referred to as “Retros” – a pejorative used to refer to their regressive lifestyle. But whether it is for religious reasons, personal reasons, or because they fear that Earth and the Inner Colonies have become consumed by runaway change and progress, the people who call these moons home prefer to maintain a balance. 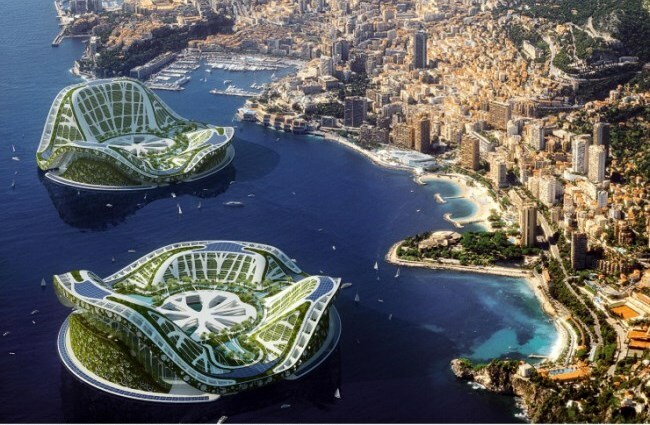 Whereas these colonies were established in the latter half of the 21st century to ensure that humanity would have backup locations in case Earth died one day, by the 22nd century, they became dedicated to the preservation of something else. In this day in age, it is no longer about ensuring humanity’s physical survival, but rather preserving its spirit or a certain way of life. Enter into this universe Jeremiah Ward, a disgraced former-detective who developed a drug problem as a result of his stressful work and the pace of life in the Inner Colonies. After an incident where two witnesses were murdered – which was attributed to negligence on his part – he is given a hefty prison sentence, which he decided to serve out in a penal colony on Mercury. On this planet, where the day-side is hellish and unlivable, and the night-side is freezing and unlivable, mining crews live in the northern crater known as Prokofiev. Given the planet’s slow rotation (which takes 58 days to rotate once on its axis), mining crews go out to the night-side, spend days harvesting ore, and then transport it back to Prokofiev, where it then processed and fired off into space. After a few years of this miserable existence, Ward is approached by a faction from Mars. Known as the Formists, this well-connected and powerful faction has a very strong standing on Mars. And they have a problem. One of their prospectors, who was traveling to the Outer Colonies to investigate their resource extraction operations, has gone missing. Worse yet, this prospector apparently had “sensitive materials” on his person that the Formists don’t want falling into the wrong hands. These materials, they claim, detail a plan to convert Mars into a livable environment over the next few generations. 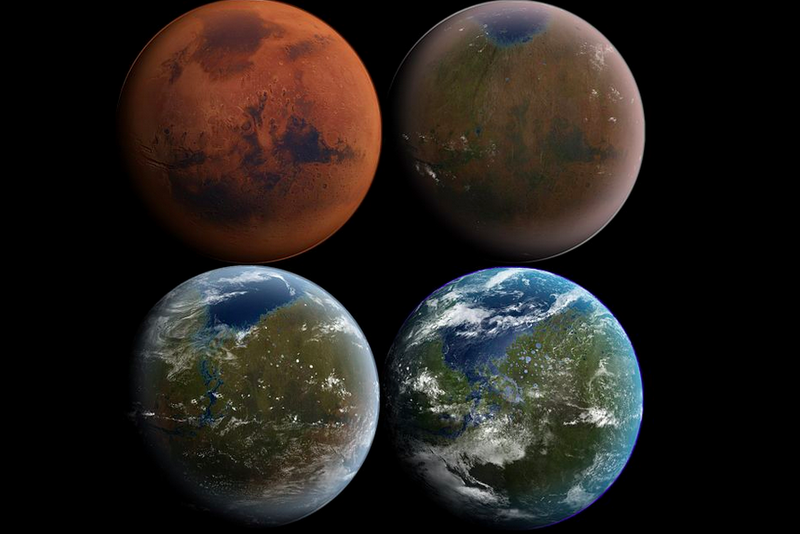 Consistent with the Formists long term plan to terraform Mars into a new Earth, they are hoping to expand their contracts with the Outer Colonies for the vast amounts of resources they will need to do so. If these plans are made public, they worry that one of the rival factions – the Dysonists, the Habitationists, Settlers or Seedlings – will try to take advantage. In exchange for finding their colleague and obtaining this information, Ward will have his sentence reduced to time served. He is told that his experience as an investigator makes him well-suited to the task, as well as the contacts he made in the Outer Colonies during his many years of service. But of course, he knows the real reason why he was selected: as a convict, he will be well-motivated to get the job done, and will be less likely to ask questions. 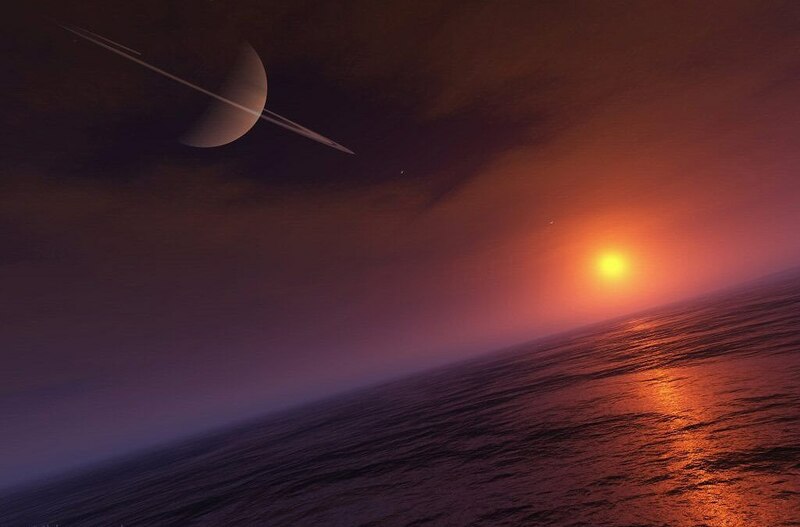 His journey takes him from Mars, to Jupiter’s moons of Ganymede and Callisto, and eventually to Titan – Saturn’s largest moon and the last stop of the prospector before he disappeared. When he finally comes to the end of his investigation, what he finds is far more than he bargained for. Rather than simply being a case of kidnapping or a hate-crime perpetrated by angry Retros, the prospector’s disappearance is part of a conspiracy that goes right to the heart of the Formist’s agenda. More than that, it goes right to the heart of an ongoing struggle, one which humanity has been preoccupied with for over a century. 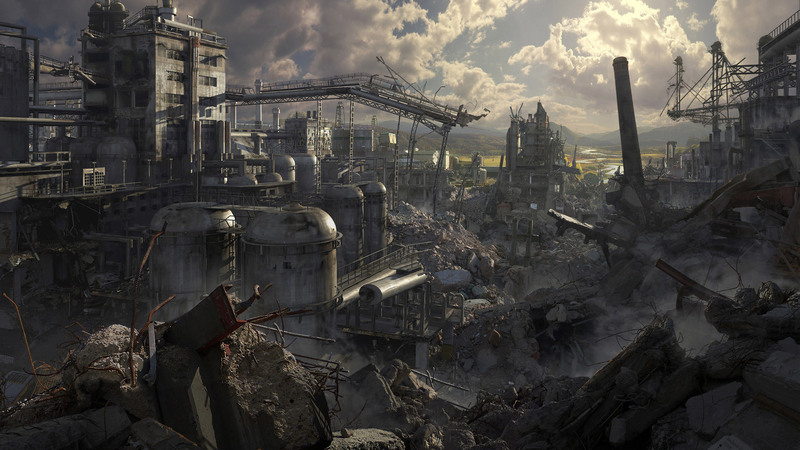 For in the end, the issue of humanity’s long-term survival has not been settled. And the solution to this problem just might mean sacrificing the few to save the many. In the end, Ward will be faced with a terrible decision: expose the agenda and spend the rest of his life on the run, or complete his mission and let things fall where they may? So that’s the idea. How does it sound? I’m five chapters in and quite hopeful that it will turn out to be something “magnum opus-y”. It certainly has been a momentous few weeks for space exploration! Between the final weeks of August and the month of September, we’ve seen the Curiosity rover reach Mount Sharp, the Rosetta spacecraft created the first full map of a comet’s, the completion of the Orion space module, and the MAVEN orbiter reach Martian orbit. And before the month is out, India’s Mars Orbiter Mission (MOM) will also arrive in orbit around the Red Planet. Despite all these developments, that occurred (relatively) close to home, there was even more news to be had, coming all the way from the edge of the Solar System no less. At the tail end of August, NASA announced that the New Horizons space probe passed Neptune orbit and is on its way to Pluto. Launched back in 2006 for the purpose of studying the dwarf planet, the probe is expected to arrive on July 14th of next year. 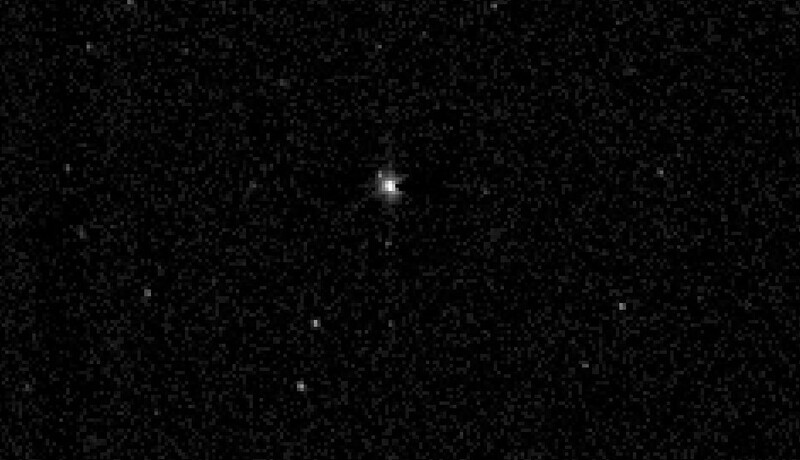 NASA says that the the craft passed the Neptunian orbit at 10:04 pm EDT on Monday August 25th, which coincided with the 25th anniversary of Voyager 2’s flyby of Neptune in 1989. But where Voyager came within 4,950 km (3,080 mi) of the gas giant, the New Horizons craft passed by at a distance of 3.96 billion km (2.45 billion mi). The spacecraft is now almost 4.42 billion km (2.75 billion mi) from Earth, and is the fastest man-made object ever sent into space. Nevertheless, New Horizons’ Long Range Reconnaissance Imager (LORRI) was still able to capture images of Neptune and its giant moon Triton. As you can see from the image below, Neptune appears as the large white disc in the middle, while Triton is the small black dot passing in front and sitting slightly to the ride. NASA says that Triton may be very similar to Pluto and the information gathered by Voyager 2 may prove helpful in the coming encounter. Ralph McNutt of the Johns Hopkins University Applied Physics Laboratory. There is a lot of speculation over whether Pluto will look like Triton, and how well they’ll match up. That’s the great thing about first-time encounters like this – we don’t know exactly what we’ll see, but we know from decades of experience in first-time exploration of new planets that we will be very surprised. 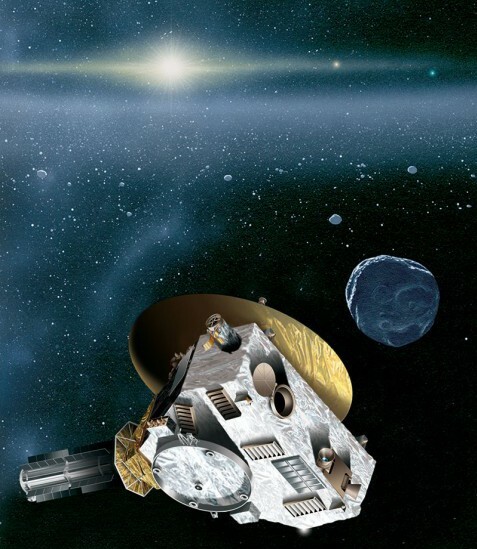 The first mission in NASA’s New Frontiers program, the New Horizons mission was launched on January 19, 2006 atop an Atlas V rocket from Cape Canaveral, Florida. It broke the record for the fastest man-made object on lift off with a speed of 58,536 km/h (36,373 mph). 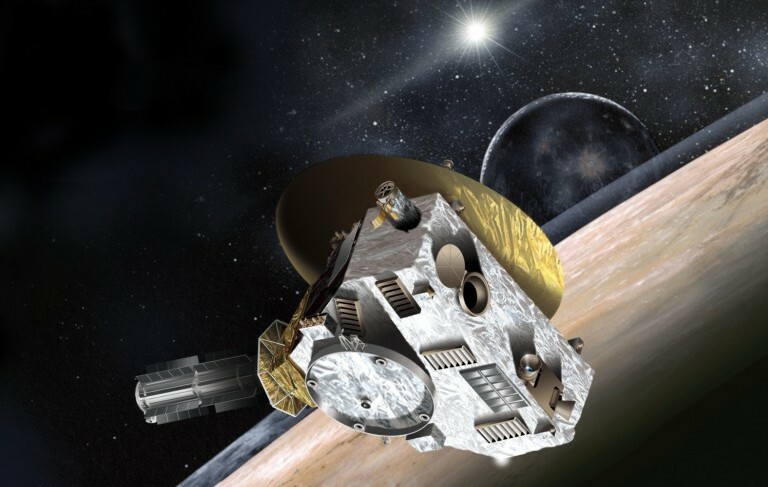 The 478 kg (1,054 lb) spacecraft was sent on a 9.5-year mission to fly by Pluto – a distance so far that radio signals from the nuclear-powered probe take four hours to reach Earth. Sent on a slingshot trajectory using the gravitational pull of Jupiter, which tacked on another 14,480 km/h (9,000 mph) to its speed, New Horizons will pass Pluto in July of next year at a distance of 13,000 km (8,000 mi). After this encounter, it will continue on out of the Solar System, during which it will be in the distant Kuiper belt studying one or more Kuiper belt objects (KBOs). Though this will still not rival Voyager 1’s accomplishments, which left our Solar System last year, New Horizons promises to gather far more information on the Outer Solar System and what lies beyond. All of this will come in mighty handy when at last, humanity contemplates sending manned missions into deep space, either to Alpha Centauri or neighboring exoplanets. 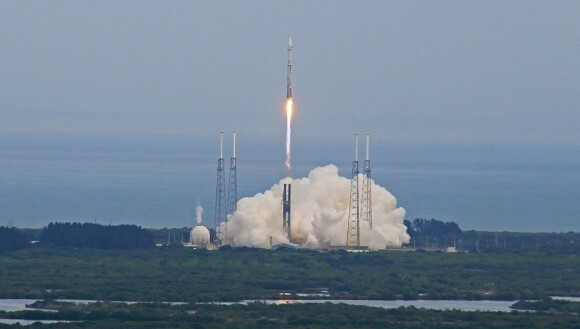 In November 2013, NASA launched the Mars Atmosphere and Volatile Evolution (MAVEN) space probe from Cape Canaveral. Described as a “time machine” for Mars, the orbiter would spend the next ten months traversing space, assuming an orbit around the Red Planet, and look for an answer as to how Mars went from being a planet with an atmosphere and water to the dried out husk that we know today. And this evening, after trekking some 711 million kilometers (442 million-mile) across our Solar System, MAVEN will have arrived in orbit around Mars and will begin its year-long mission to study the planet’s upper atmosphere. The arrival will be broadcast live, courtesy of NASA TV and Space.com. The live webcast will run from 9:30 p.m. to 10:45 p.m. EDT (0130 to 0245 GMT), and if all goes well, MAVEN will enter orbit around Mars at 9:50 p.m. EDT (0250 GMT). So far, so good with the performance of the spacecraft and payloads on the cruise to Mars. The team, the flight system, and all ground assets are ready for Mars orbit insertion. Though plans to study Mars’ atmosphere in detail have been in the works for years, the MAVEN program received a big push from the ongoing efforts from the Curiosity rover. 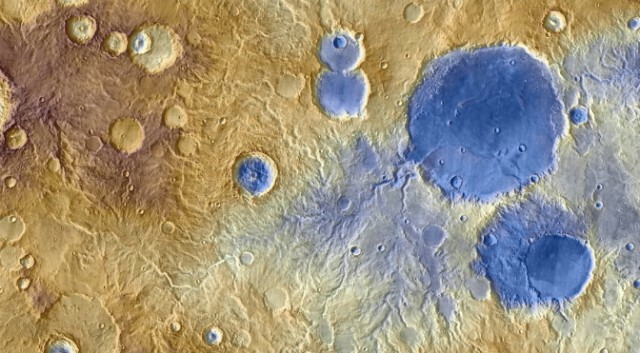 During its ongoing mission to study the surface of Mars, Curiosity was able to confirm that Mars had extensive surface water billions of years ago. This revelation came very early in the mission, and indicated some rather interesting things about Mars’ past. For instance, although Mars is now too cold for flowing water today, it might have had a thicker atmosphere in the past that warmed its surface and allowed the liquid to remain stable on the surface. And while scientists have a pretty good idea how it was lost (i.e. too far our Sun, too low a gravity field), the rate of loss and when it disappeared are just some of the questions that MAVEN will attempt to answer. Much of what scientists know about Mars’ upper atmosphere comes from just a few minutes’ worth of data from the two Viking landers that took measurements as they made their way to the Martian surface in the 1970s. This time around, NASA will be able to collect data for an entire year, gathering far more data than either the Viking landers or any other spacecraft has since had the opportunity to do. 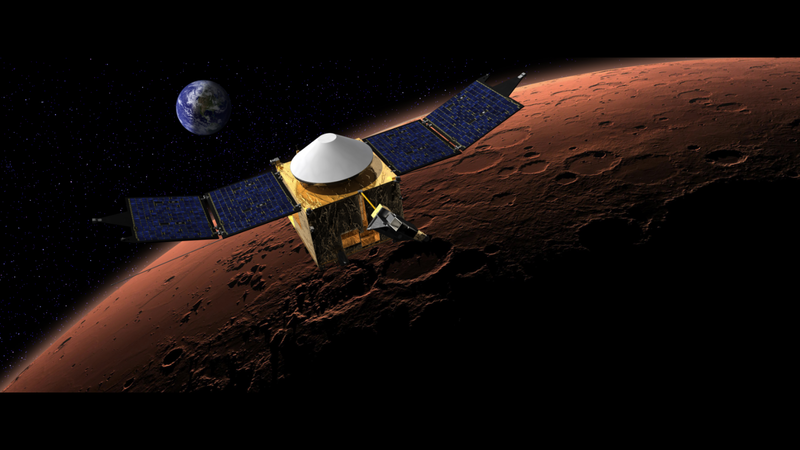 The MAVEN science mission focuses on answering questions about where did the water that was present on early Mars go, about where did the carbon dioxide go. These are important questions for understanding the history of Mars, its climate, and its potential to support at least microbial life. 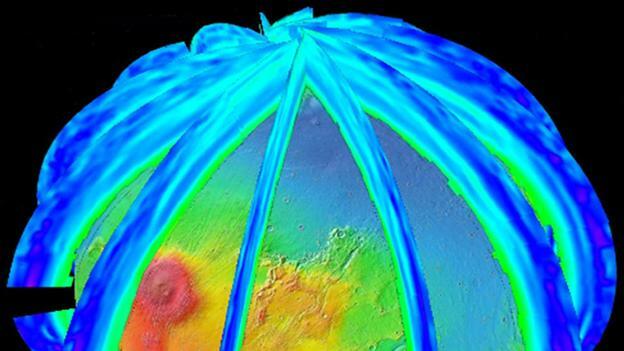 NASA scientists understand that Mars’ upper atmosphere acts as an escape zone for molecules floating dozens of miles from the planet’s surface. They theorize that as the solar wind hits the atmosphere, the radiation strips away the lighter molecules and flings them into space forever. 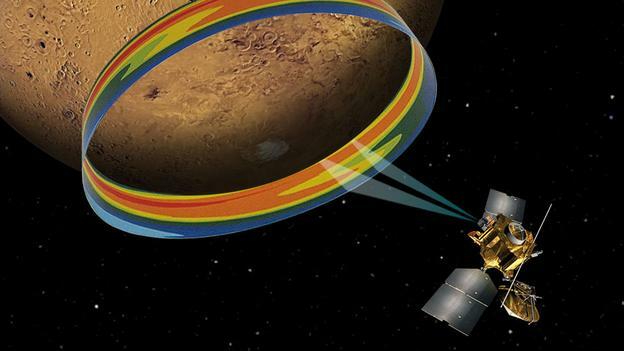 To test this hypothesis, MAVEN will be examining the state of Mars’ upper atmosphere, and ionosphere to determine its interactions with the solar wind. In so doing, NASA hopes to determine what the current rates of escape are for neutral gases and ions, and thus get a better picture of how long it took for the atmosphere to degrade and when it began degrading. The upper atmosphere of Mars likely changes as the sun’s activity increases and decreases, which is why MAVEN investigators hope to run the mission for longer than a year. MAVEN will began making science measurements around Nov. 8, due to it taking a short break from its commissioning phase to watch Comet Siding Spring pass close by on Oct. 19. The $671 million MAVEN spacecraft is one of two missions that launched toward Mars last November and which are making their arrival this month. The other probe is India’s Mars Orbiter Mission, which launched just before MAVEN and will arrive at the Red Planet this Wednesday (Sept. 24).